Henryka here. I will show you today how to make a Layered Christmas Card. I do it with my scissors. Then you glue them to your base, first bigger and next smaller. and one longer side you need to be torn. Next, you layer those two pieces, alternating with winter hill border and white gauze. The last layer you attach with distance foams. Attach white poinsettia wreath to the centre of your composition and with distance foam, matching stiched nested circle. Merry Christmas cut from an Adhesive Vinyl Silver Glitter you glue on white card and you cut around with margins. You attach sentiment to your card with distance foam. Attach 5 small poinsettias of poinsettia wreath, you can put them where you like to have a nice composition. 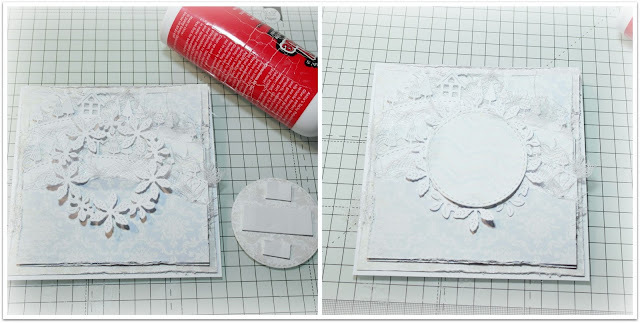 Lastly, apply glitter on your card to give some frosty look. And the Layered Christmas Card is ready. Hope you like my step by step tutorial and you will try to make a card like this. Labels: Henryka Kowacz, Tutorial Thursday, Tutorial Thursday.